It's been a long time since I've written (or done) much of anything. I've reached a crossroads in my life—two distinct paths have opened up to me: one appeals to my wandering soul, while the other requires a great deal of persistence and hard work. One path would be a comfortable road for me—while the other would be extremely uncomfortable. There are voices (in the world and within myself) that would urge me to take the comfortable road. "Do what makes you happy," the voices would say. "Follow your bliss." As nice as that sounds, I feel compelled to reject those voices. I have sat, quite comfortably, at the crossroads for a long time and I can tell you that comfort isn't happiness. Fulfillment is a product of labor. Joy comes after the exercise faith. I recently finished watching the Ken Burns documentary on the Roosevelts. I was struck by how much each of the Roosevelts (Teddy, Eleanor, FDR), successful as they were, struggled with depression and heartache. As each episode detailed their secret struggles, I marveled at how each of them found the strength to persist—to move forward. 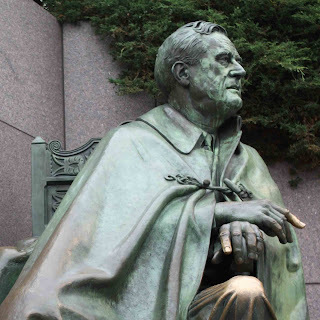 I was particularly inspired by Franklin D. Roosevelt, who, after being crippled by Polio at age 39, was able to tap into an inner faith that led him onward. He became the President of the United States and led the nation through the Great Depression and on to victory against Nazi Germany. Any way you look at it, his story is absolutely remarkable. We often refer to Roosevelt's generation of Americans as "the Greatest Generation." I think we do that because of how they moved forward with faith even though everything seemed to suggest that the world was collapsing around them (the Great Depression, the Dust Bowl, and World War II). I have many reasons to doubt myself and to search for an easier road. But after reading Roosevelt's words, I feel compelled to move forward with strong and active faith. Perhaps you, too, are searching the strength to move forward. I urge you to continue onward. The road may be hard, but the reward of faith is great. Hellen Keller put it this way: "Character cannot be developed in ease and quiet. Only through experience of trial and suffering can the soul be strengthened, ambition inspired, and success achieved."